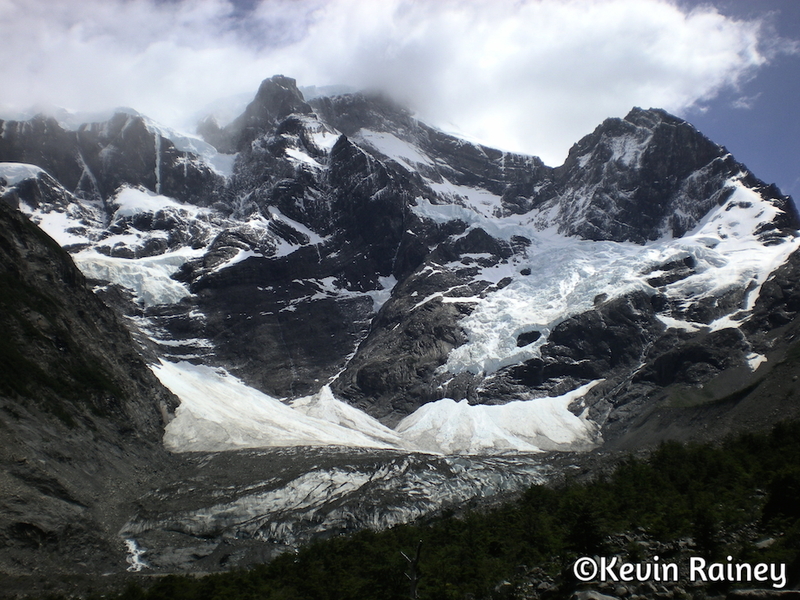 This morning as I woke up and opened the tent door, I was astounded to see Paine Grande towering above us as it peeked through fast moving clouds. This was going to be a great day! After hot showers and a Chilean breakfast of eggs, bacon, sausage and biscuits, we went back to our tent and grabbed our backpacks. We hiked 8 km (about 5 miles) on a 3-hour trek up to Campamento Italiano. 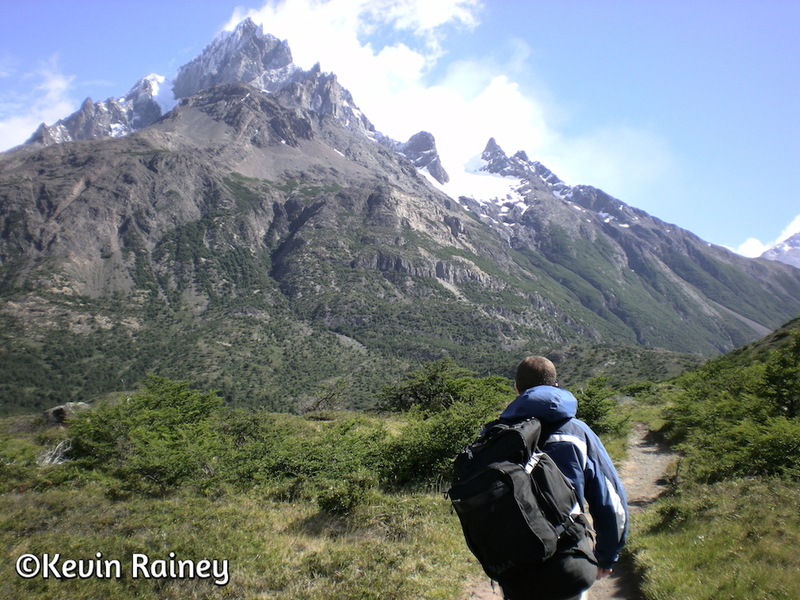 The first part was uphill with outstanding views of Paine Grande. Then we winded down through beautiful meadows of flowers and tranquil streams. Along the way, we hiked on boardwalks across steams and grasslands before crossing some thundering rapids on some amazing wire swinging bridges. Upon arrival at the Campamento Italiano, we ate our packed lunch before dropping our large bags. Then we filled up our water bottles and grabbed our daypacks for a great hike. Jeff and I decided to hike the middle branch of the W, about 5.5 miles roundtrip to the Mirador del Francés (French Overlook). 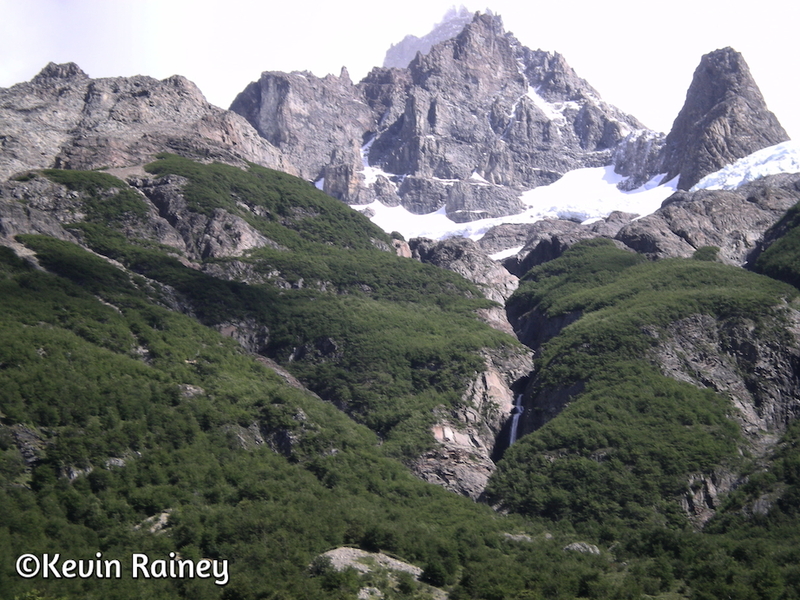 We trekked up the Valle Francés (French Valley) through lush meadows by a roaring stream in the shadow of Paine Grande. We reached a rocky trail through a boulder field that we needed to hike to arrive at the overlook. Unfortunately, Jeff started having some issues with a ligament near the patella of his right knee. He was in a great deal of discomfort, so we decided to call the hike off and we walked slowly with me helping him back to camp. Jeff had never had this happen to him before, and we didn’t know how bad his situation was. 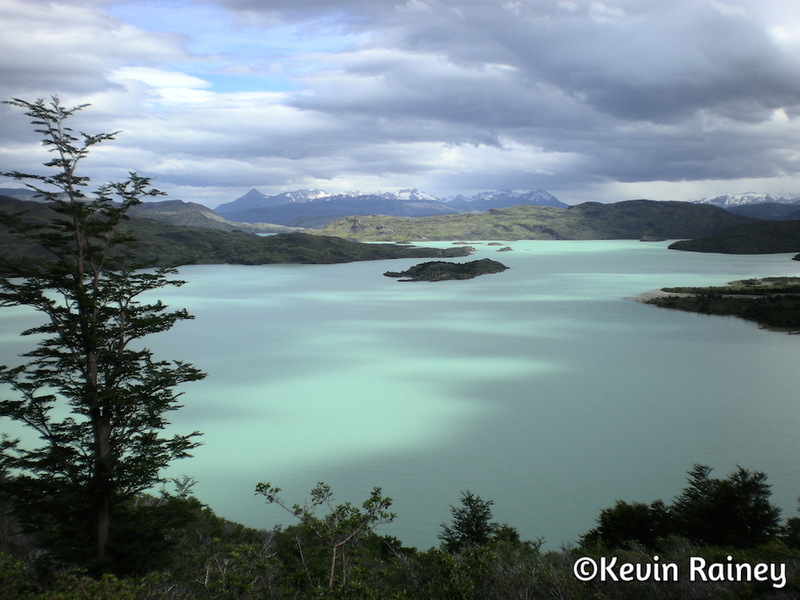 We took it easy on our 2.5-mile (4 km) hike along the shore of magnificent Lago Nordenskjöld to Refugio Los Cuernos. 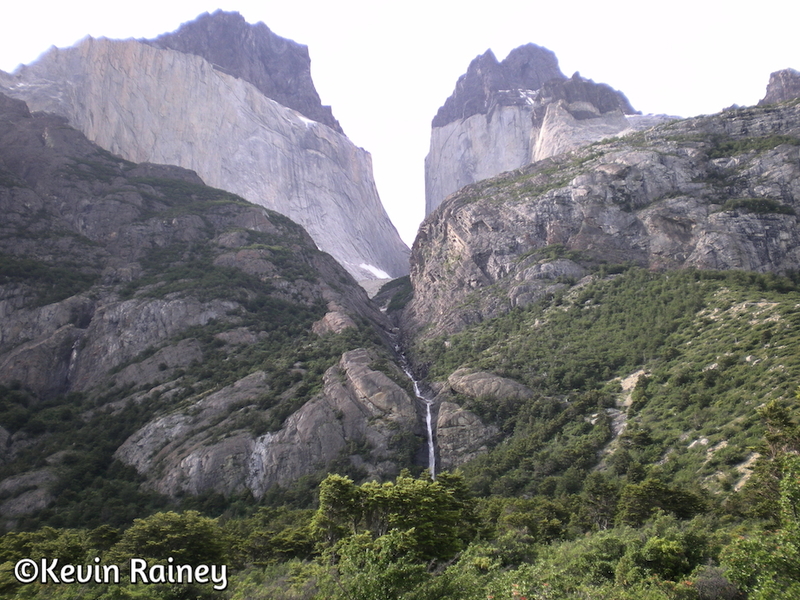 As we hiked along a ridge leaving the valley below, we caught our first glimpse of the famous Cuernos, or horn-shaped peaks of granite that jutted into the Patagonia skyline. To our right, the magnificently long Lake Nordenskjöld, with its perpetual greyish tint caused by glacial silt, rolled across the horizon with violent waves. Once again, the infamous Patagonian wind put on a dramatic show. With the wind at our backs, we saw it whip up the lake below into mini waterspouts. The waves were also extraordinary and made us glad not to be in a boat on the lake. As we hiked around the middle of the W, we enter another valley with spectacular views of giant granite sheer cliffs to our left. We saw several, multi-tiered and huge waterfalls streaming down the cliffs. That’s when we saw our first view of the renown Cuernos, or Crowns. Sharp spiny peaks topped this side of the range making the mountains look like they were crowned. After crossed swinging bridges over rushing rivers and hiking around the Cuernos past waterfalls, we arrived at Albergue Los Cuernos that evening. Outside a stereo system boomed the thunderous beats of some Chilean kumbia music. 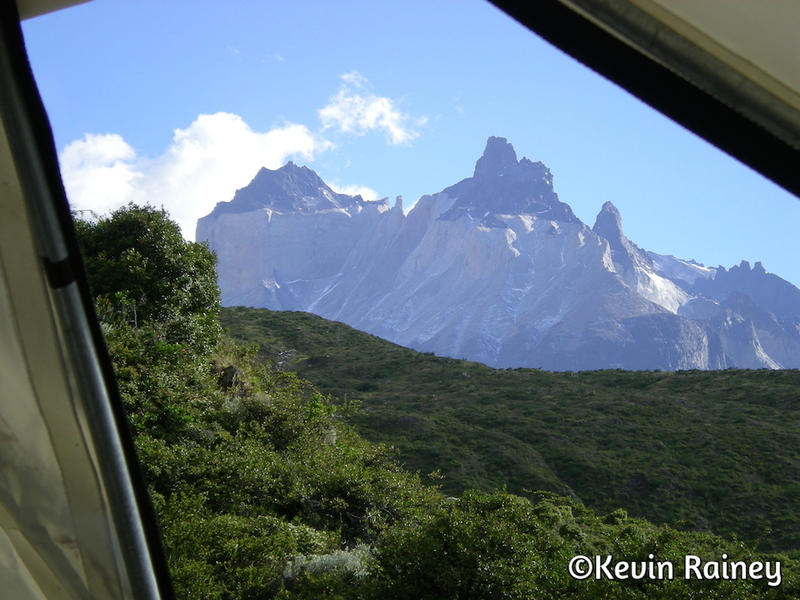 Upon arrival, we checked into our tent, located along a stream on a rocky ridge above the refugio. We then killed some time outside the albergue planning our journey for our journey for Sunday. One gorgeous Chilean girl who worked at the lodge was intrigued by my Barhma hat. I explained that it was Australian kangaroo leather and she tried it on. She was quite happy with it. Not long afterwards, we entered the albergue for dinner. We sat at wooden tables in the dining room underneath large glass windows looking out towards the Cuernos. This had to be the best dinner I had ever seen from a backcountry dining room! What made the view even more festive were the abundant Christmas decorations of tinsel and wreaths lining the windows of the dining room. I had almost forgotten it was about to be Christmas. After a filling dinner of beef, biscuits and mashed potatoes, we watched the sunset on the ridge before hitting the sack.